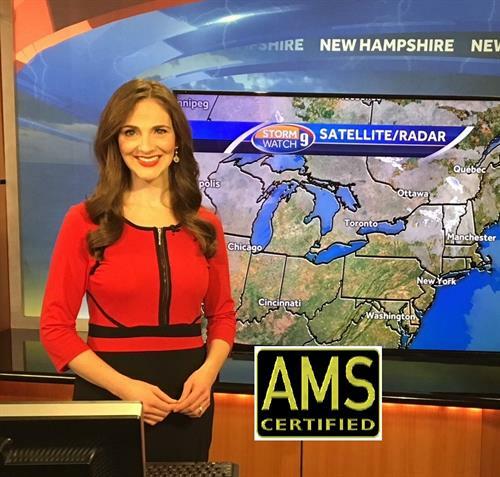 WMUR Meteorologist Hayley LaPoint will headline the New Hampshire High Tech Council (Council) TechWomen Power Breakfast on Wednesday, April 11 from 7:30 to 9 am and will discuss the predictive technology and tools used in meteorology, and the accuracy of weather forecasting. The April Power Breakfast will be held in the Squamscott Room of the Holloway Commons Building at the University of New Hampshire, 6 Mill Road in Durham. LaPoint is the weekend evening meteorologist at WMUR-TV. She grew up in Topsfield, Massachusetts, and earned her Bachelor’s degree in Meteorology from Lyndon State College. She also earned an Associate’s degree in TV News. LaPoint has worked for WPTZ-TV in Plattsburgh, New York and Burlington, Vermont and KVLY-TV in Fargo, North Dakota. She’s received the Certified Broadcast Meteorologist seal from the American Meteorological Society. Parking for the April breakfast is metered and is available in the Campus Crossing Visitors on the UNH campus in Durham. In the rear of the lot is the Memorial Union Building, which is attached to Holloway Commons. The entrance is located on the far right of the loading docks. The elevator will lead to the first floor and the Squamscott Room. Tickets for the April Power Breakfast are $10 for Council members, and $20 for not-yet-members, and include breakfast. Tickets are available here or by calling 603.935.8951. Seating is limited, so individuals are encouraged to register early.